This first day was the 4H sponsored show. Children from around the state coming in to show their animals! How great is that! So the first show of the day was Showmanship. Once it was our Jessica’s turn to get in the ring, she took our oldest and most seasoned doe in the ring, smart move. Jessica didn’t fair that well this time, as this was her first showing ever. Although, we thought she did pretty well, just some small things that she needed to improve on. However, the judge took ample time with all the 4H’rs in the ring and not only judged them on how they were showing, but taught them how to show. We were very pleased as parents to see him take so much time. Jessica learned a lot that morning. The next Showmanship contest was the next day and Jessica took our most unruly crazy troublemaking goat (Queen) into the ring. Jessica ended up 2nd out of 7. That was pretty awesome, no ribbon, but the lessons learned from the day before were well taken. The afternoon of the 4H show 5 of our 6 does were shown. And low and behold…that crazy troublemaking goat not only won Champion in her Alpine age group, she came away with Junior Doe Reserve Best in Show! We couldn’t have been more proud! 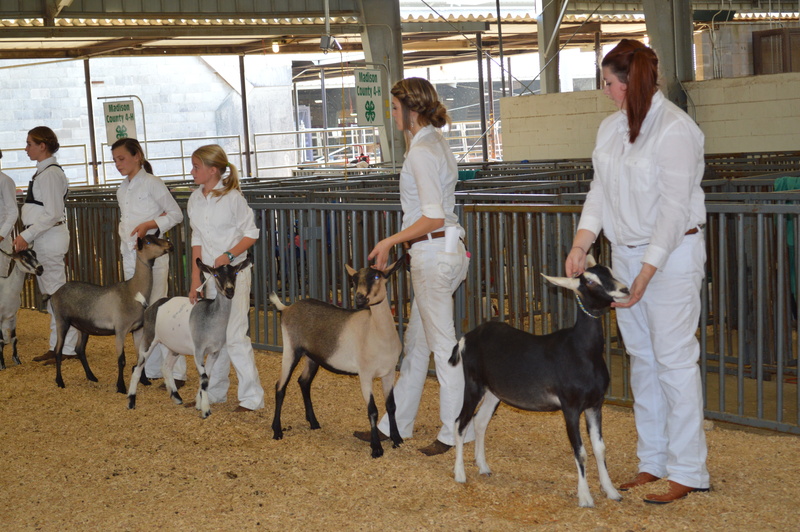 One thing we did learn was that in the 4H, if you have two animals showing in the same class, you must have a substitute to show your goat and it has to be another registered 4H’r and this must be done prior to the goats being shown. So on to the next two shows over the next two days. The State Fair Show on Saturday and the Mississippi Goat Association show on Sunday. We showed all six does we took and they did well and received many good comments from the judges. 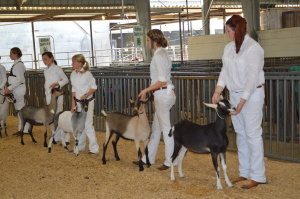 One of our senior does received Champion in her class of Nubians and the other received good remarks from the judges. Our junior does did well for the most part. Some high in the rankings and some low, however most of them received good remarks. We also received a “Clean Isle Award” banner. This is for keeping our area clean and neat. This is how we roll at Camelot Hills, we like things clean, neat, and organized. We met some wonderful people and put faces to names during this process and made new friends. We were fortunate enough to have pen neighbors that were very helpful. They were Ken and Brenda Goff from Briarcrest Farm. We loved talking with these two, they answered questions, gave suggestions and helped us understand a lot that we didn’t even know we needed to understand. So a shout out goes out to Briarcrest! There were several others that helped and gave much needed and accepted advices and we thank all of them as well. We look forward to seeing all of them again at the next shows! So all in all the showing for the fair weekend was a success, even better than we’d hoped. We were educated and actually placed. Something we did not expect. As with all learning experiences, we learned many valuable lessons and now have more knowledge to grow with. Please remember to subscribe to our newsletter to receive notifications of new baa-logs!